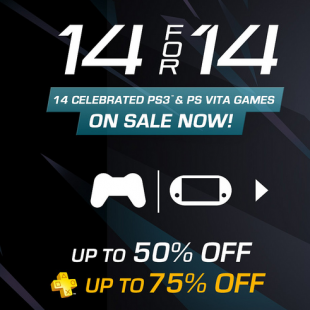 The PlayStation Store is discounting 14 select PS3 and Vita games from January 14th until January 21st. Tomorrow will be a good day for PlayStation fans. In addition to adding Bioshock: Infinite to the PS Plus Instant Game Collection, Sony will be hosting a special "14 for '14" promotion offering some hefty discounts on digital edition software for the PS3 and Vita. To be more specific, standard customers will stand to save up to 50 percent on PS Store wares while PS Plus subscribers will receive a discount up to 75 whopping percent. These discounts will run for a week, lasting from Jan. 14 until Jan. 21. That in mind, we're curious to hear if there's anything among the sale items that you're particularly interested in. Personally, I'm probably going to pick up a season pass for The Wolf Among Us and maybe invest in the digital version of Metal Gear Solid: Peace Walker The PS Plus discount for Killzone: Mercenary also looks pretty danged sweet. We'll see though, even us wealthy game journalists have limits.